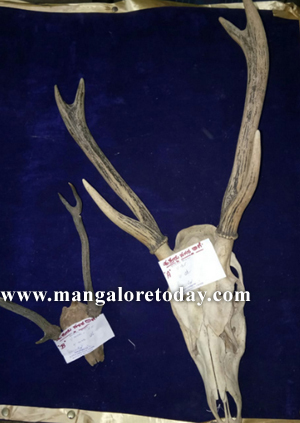 Mangaluru, Aug 22, 2018: Puttur Police have arrested four persons who were transporting two deer horns in a car. One of the accused however succeeded in giving the cops a slip. The arrests were made during inspection of a Maruti Zen car near the Linet byepass at Puttur following a tip off. Though the accused tried to flee they were subsequently trapped. The accused are Shaiju (26) of Kodimbala, Saji (40) and Sajith Abraham (29) of Kutruppady and Sandeep (29) of Ajekar. Another accused Ranjith Kodimabala is absconding. The accused intended to sell the deer horns at Ajekar.